Author: Bingham, Jeffrey, Kreider, Glenn R.
This is a 2015 Moody book but produced primarily, actually entirely, by Dallas Theological Seminary professors and/or graduates. Being a dispensationalist myself, I enjoyed the book and profited from its material. I am glad for any scholarly writing that defends the dispensational approach to Scripture because it is being attacked in many unfortunate ways these days. Bingham is Associate Dean of Biblical and Theological Studies at Wheaton College and Kreider is Professor of Theological Studies at Dallas Theological Seminary. Both hold ThM and PhD degrees from Dallas. This book is also a defense of current dispensational thought from the Dallas Seminary perspective. This means that the book defends the history of dispensationalism including its beginnings with men such as John Nelson Darby through C.I. Scofield and L.S. Chafer, and the Niagara Bible Conferences, but it also makes a wide berth for the progressive dispensationalism currently at Dallas Theological Seminary. In fact, two of the chapters are written by Darrell L. Bock and Craig A. Blaising, the most well-known defenders of that view. Therefore, though I cannot accept the progressive dispensational perspective myself, I still profited from the book and even got a better or newer understanding of Bock’s and Blaising’s points of view without having to read their books again. Most of the rest of the book I was in agreement with. A further caveat would be, that though all dispensational thought is given from a positive perspective, the writers divide the history into three categories they call classical, revised, and progressive (a division first suggested by Bock and Blaising in their 1993 book Progressive Dispensationalism). The “classical” category is left for the formative thinkers from Darby to Chafer. The “Revised” category is used of the standard view of Dallas Seminary primarily in the years of Walvoord, Pentecost, Ryrie, and contemporaries such as Robert Saucy (and, presumably others in the Talbot Seminary and Grace Seminary mold). The “Progressive” category is primarily promoted by Bock and Blaising at Dallas today. In fact, Blaising writes the main chapter on these categories. 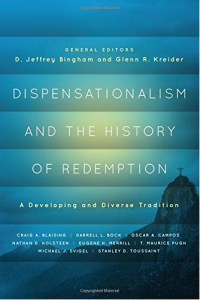 But also Kreider, in the first chapter (which is a very informative chapter on the history of dispensationalism) says, “This chapter has not made much of the recent development described as progressive dispensationalism. The focus has been on what unites rather than what divides. To say it another way, what all dispensationalists hold in common is much more important than the nuances of distinction between dispensational views” (p. 39). I would like to recommend this book to those who have bought into the negative diatribe about dispensationalism, and I can do so but with reservation because of the soft promotion of progressive dispensationalism. I suppose someone who knows little about dispensationalism would be unaffected by that anyway. The history, the defense of a separation of Israel and the church, the defense of literal interpretation (with the exception of PD), the pretribulational, premillennial emphasis, all make the book worth reading. For me, I would pay the price to read Eugene Merrill’s chapter on “God’s Plan for History Prior to Christ,” and Stanley Toussaint’s chapter on “God’s Plan for History: From the Ascension to the Second Coming of Christ.” Both of these writers come from the more traditional Dallas approach. Toussaint especially defends literal interpretation, a pretribulational rapture, and even a definite reoffer of the kingdom in the book of Acts. At the same time, those looking for a completely future view of the new covenant will not find it among these writers. But that is not made a major component of dispensationalism in this book either. At the end, Maurice Pugh (a pastor) gives a very good critique and comparison of Covenant (and Reformed) Theology with dispenstionalism; and Oscar Campos (Missiology professor in Central America) gives an encouraging history of how faith missions is historically connected to dispensationalism.